The experience of reading 4321 was one of the best parts of 2017, and the disappointment I felt when it didn't win the Booker Prize was one of the low points of the year. To be fair, I haven't yet read Lincoln in the Bardo (the winner), so maybe I over reacted just a bit. In any case, after many years and several excellent books, Paul Auster has given me a precious gift through this book. I mentally lived several lives (that of the protagonist and imagined deviations of my own life), and understood myself better. All of us wonder about the extent of determinism vs. free will in our lives. We all wonder if our lives could have taken drastically different journeys if only we had taken a certain fork in the road, or if only a random event had not happened or happened at a different point in time. So many what-ifs, so many parallel universes that materialize in our heads as we indulge in wishful thinking and conjuring. Would we be the same person we are today if we lived in a parallel plane of time and space where we took a different route? Would we be happier, more fulfilled, or less so? If only, if only, if only we knew! So, Auster imagines and writes four different lives - four deviations and what-ifs for his protagonist - the sensitive and good natured Archie Fergusson. And through his compelling, exhilarating, and brilliant writing, the fog is lifted, the nagging voice of what-ifs quiets down. You are who you are, no matter the external journey! Your internal journey is what counts. Yes, depending on your circumstances, there will be detours, changes, adaptations etc., You will either change for the better or for worse, but certain fundamental things about you - your natural proclivities, what brings you happiness and fulfillment, the things you always seek - will remain the same. In that sense, it doesn't matter what turns you took or did not take, what unfortunate or fortunate circumstances befell you, everything neutralizes in the bigger picture. This is hard to articulate, but I will try, if only for better clarity for myself. Considering my current life to be the neutral average baseline, I'll consider a few drastic alternatives, one of which is living on the streets out of poverty. This seems the most drastic of all, but if I walkthrough the scenarios (despite the caveat of living in your mind vs. facing the reality of it), I realize that no scenario will give me more sorrow or more happiness or more fulfillment than the other. They all neutralize with their different kinds of peaks and lows. Yes, living on the streets seems more harrowing, but if that's all I know, and am surrounded by, my measure of happiness would be different anyway! The types of choices I make will be similar, my inclinations will be similar, leading me down similar paths, thus living a life that will vary in its specifics, but in a broader perspective, everything adds up to the same equation within you. I'm not denying that I'm more luckier or blessed than someone on the streets. I'm not saying I might as well live on the streets. I'm not in any way trivializing poverty. Definitely not. I am indeed blessed in so many ways, but in everyday life, we all get habituated to our individual blessings (as well as miseries) and revert to some internal equilibrium that is more or less the same regardless of the specifics of your life. We keep thinking that the extent of one's happiness or fulfillment is tied primarily to circumstances and getting/receiving things - material and otherwise. So, we are prone to wondering how the journey of our life could have been idealized, re-lived, and re-traced to ensure maximum fulfillment. What a realization that it doesn't matter a whit! Such an ideal journey cannot exist either! It's always up to you - no matter where you are - to realize yourself and attribute meaning/happiness. Here's another illustration through a story from the Panchatrantra (Indian fables) that I've been reminded of so much lately. A learned sage and his wife are desperately seeking to have a child. The sage immerses himself in a long and powerful prayer to God. Having finished his prayer in the Ganges, he flings out his arms in entreaty, and a mouse, slipping from the talons of an eagle flying overhead, neatly lands in his hands. The sage treats the mouse as God's blessing, and using his ascetic powers transforms it into a beautiful baby girl. The couple are ecstatic with the child, and raise her with much love. Soon, it's time for the girl to get married. The doting father wants only the best bridegroom for his daughter. He introduces her to some of the most powerful forces and lords of nature - the Sun God, the Wind God, and the God of Oceans. The girl is not impressed with any of them and refuses to marry. The sage than takes her to the powerful, majestic God of Mountains. The girl is unmoved by his magnificence and is walking away, when she spots a mouse scurrying from the mountain. She instantly falls in love and wants to marry the mouse! The sage resigns and accepts the nature of reality, and transforms her back to her true self - a mouse. We each have our own inner trajectory independent of the nature of circumstances! Call it biological determinism or destiny or anything else - but hopefully the realization frees you to appreciate and make the best of your present. 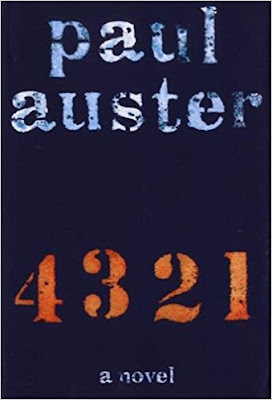 I fell in love with Auster, his writing, Archie, and every aspect of this book that relentlessly propels you to chase the words, to want to ravenously consume all the thoughts, to wrap yourself with the emotions, to inhale and to live, to submerge and drown, to lose yourself within the alternate worlds. Great to see this blog back in action !